In a charity programme, Reeta Aggarwal, Chairperson, SBI Ladies club and wife of Rajnish Kumar, Chairman, SBI donated water cooler with RO system, ceiling fans, sewing machines, clothes and musical instruments for children residing in an orphanage - Lala Ramanuj Dayal Vaishya Baal Sadan. The programme which was organised by Ladies Club, SBI Delhi Circle was also graced by Puja Choudhary, President of the Club. Lala Ramanuj Dayal Vaishya Bal Sadan (formerly known as Vaishya Anathalaya), was established in 1800, during the severe drought in this area. The Orphanage which provides shelter to children up to the age of 18 years are the residents of 20 boys and 20 girls. Reeta Aggarwal and Puja Choudhary addressed the children on becoming self-employed and inspired them to contribute towards the development of the society. Vinay Gupta (President of Trust) & Sh. Harsh Vardhan Rajvanshi (Secretary of Trust) appreciated the noble cause by SBI ladies club and thanked Reeta Aggarwal for their kind donations. 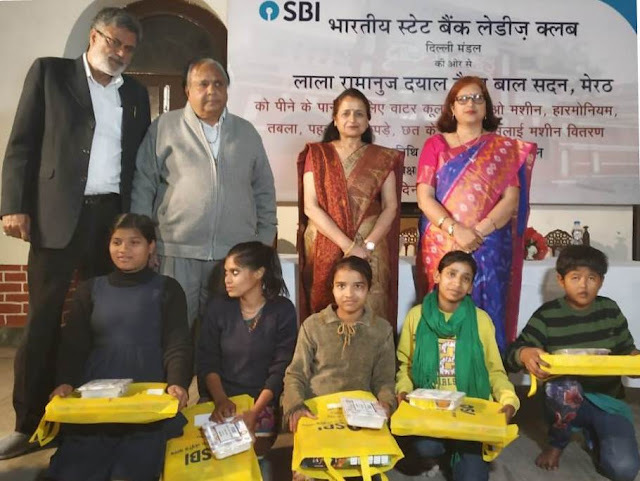 State Bank of India, Ladies club, Delhi Circle, organizes various charitable events for the upliftment and self-reliance of the needy people in the society.